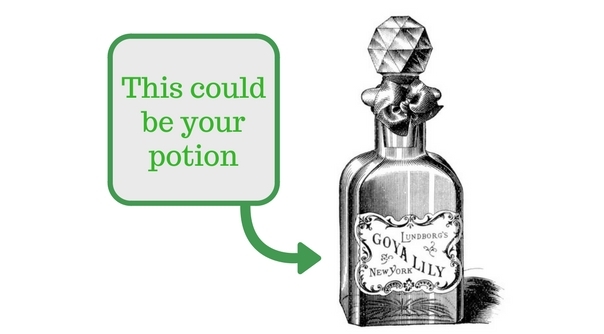 Use [insert potion name] it'll make you feel young, beautiful, loved, cherished, everything you've always wanted to be, as wonderful as you are in your head, you'll turn heads! You'll make them weep tears of joy, lust, envy. You'll want to go out and buy lots of mirrors, the mirror will weep tears of joy, lust... [insert potion name] is yours for only eight hours pay (before tax), and it'll last a whole week! No, you can't recycle the bottle. What do you want, the moon on a stick?! And who is taking responsibility for introducing dangerous chemicals into our cosmetics, food, water supply, air, land and our everyday products anyway? The ones we use on ourselves, our families, in our homes and our bodies. And whose responsibility is it that dangerous ideas linking a women's beauty with her self-worth continue to be encouraged as if they were facts? Well I wish it wasn't mine, but I think it might be, and yours and everyone's. I know being a woman is hard enough without having to fight for stuff, and be angry at the world, and 'in uproar' which sounds far too loud and exhausting, especially when life really isn't that bad anyway. But what international women's day highlighted for me was that women in the West need to campaign on behalf of all those women who are not as free and equal, who do not have a voice, or a choice. And I don't have to tell you because you already know how bad it can be for women around the world. Subjugated, second class, inferior and powerless. If we can class ourselves as leaders of women's equality and rights, then we must lead by example in whatever way we can in our own lives. Maybe we're not protestors, shouters or fighters, maybe we don't like arguing or conflict, but we can still send one very important message. That we are self-determining individuals who are not blindly led by whatever flashy coloured, 'rose gold' 'scientific sounding' chemical filled gimmick comes along. That we will build our own body of knowledge and figure out what we're using and what it might be doing to us. We will read labels for their content and not just their calories. We will be responsible for ourselves because we are free to do so. We will use our buying power to influence how the world works. For me it's taking responsibility for my beauty and my health. Not blindly believing what I'm told and doing my own research on what I'm using and what that might do to me, to my family, to my friends. Hopefully, we can help each other have a better life and help all women who suffer because of their gender. Vegetable and Essential Oils have been used for thousands of years. They were some of the first medicines ever used. Most often a single ingredient product, natural, powerful and tested by millions of people throughout the centuries, countries, climates and complaints. At Naissance we recommend Argan, Rosehip, Coconut Oil and Evening Primrose Oil because they are our most popular oils for women according to you. But don't take our word for it, we've listed some reviews below. A book we've found helpful if you want to know more about carrier and vegetable oils is: Carrier Oils for Aromatherapy and Massage by Len Price with Shirley Price. By reading, learning, understanding and experimenting we can all take greater control over our beauty and be more aware of what we're putting on our skin, in our bodies and in the environment. Blessed by Gaia said: I am loving Evening Primrose oil, it's lovely to work with! Thank you so much for leaving your comments Dominique and Janis. We love Rosehip Oil, the colour, the smell and that silky-soft feel are so natural and wonderful for your skin!